I've recently accepted that Milo at 3.5 is much less toddler than little boy. We have full on conversations all day long and he picks up on everything. He is beyond ready to figure out this world little by little! I like keeping my little buddy with me all day, so he hasn't done any type of school yet. When he dropped naps this summer (rest in peace), I seized the opportunity to step up my game to make sure he's both learning and getting to do some fun big kid things when Otto naps. Not all of our activities are educational, but they are all special things we get to do together- no babies allowed. It's been so life saving having some one-on-one time for just us to stay connected! My requirements for activities are pretty similar regardless of age: I like keeping things cheap, easy, and using things we already have at home. They also have to be fun for moms, because as much as I love trains and hot wheels, sometimes we both need a change of pace. Without further adieu, these are some of our favorites! 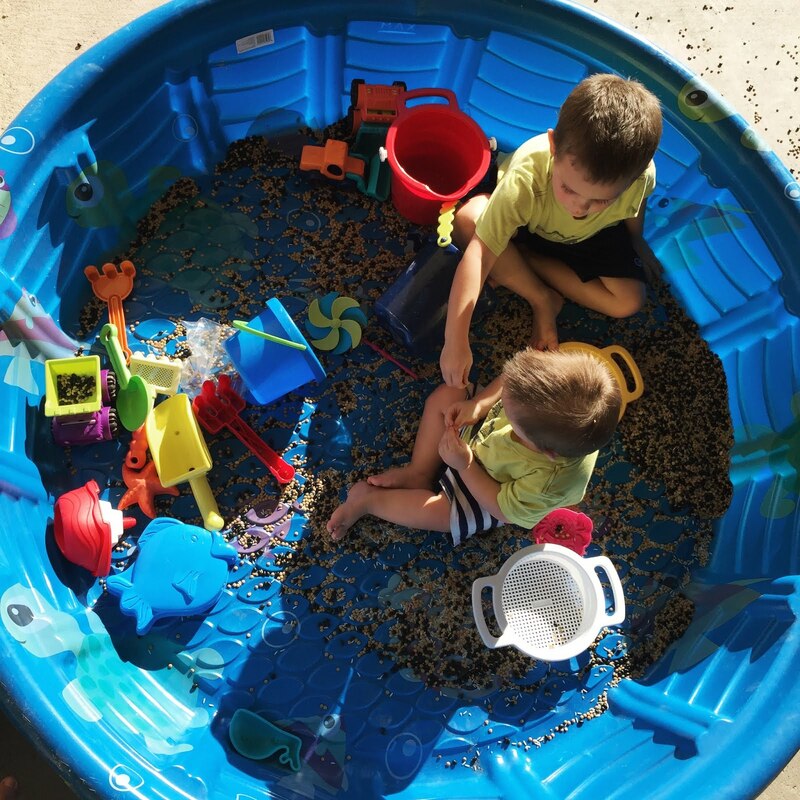 Dry beans and digging toys: We do this either on the table or in the wading pool. Inside, we spread out a beach towel, start with the beans somewhat contained in a flat baking pan, and find all the digging and sand toys and trucks we can. It's always a hit! And always a mess, but nothing a little broom and dustpan can't fix. Stringing beads: I have a ton of old beads from back in the day that Milo loves to inspect. I tie thread onto a blunt needle and he loves stringing them on while he checks out all the fun shapes and colors! Buttons: I have a ton of random sewing buttons that are old and cool and fun to sort. We get out the muffin tin and group buttons by colors, shapes, size, etc. I also numbered some muffin papers 1-10 and we count out that many buttons to put in each spot. He's still catching on to counting but we're getting there! Letter Magnets: We've been working on letter recognition and sounds, and Milo LOVES these huge letter fridge magnets. I found them in the dollar area of Target and got 2 sets. I also got a pack of shapes and numbers. Painting: Milo LOVES anything artistic. I have a bunch of hand me down craft paint from my parents years ago from a college project, and I squirt out some colors on a paper plate, strip him down, hand him a paintbrush, line the counter with a trash bag, and we go to town on some cardstock. ALWAYS fun. Treasure hunt: Milo thinks this is the coolest thing since sliced bread. I draw a rough (like REALLY rough- I am no artist!) layout of our house. I explain what everything is while I draw it. Then I draw a little line on the map to where a treat is (usually Smarties, his favorite!). He loves it! Cutting and gluing paper: I got him some cheap scissors ("we only touch the blue part, not the silver part!") and a glue stick and you would not believe how many hours of entertainment this provides. He colors, cuts, and glues his little heart out. Homemade play dough: Mix 1/4 cup water, 1 cup flour, 1 T oil, and 1/3 cup salt. Add food coloring if you want. He loves helping mix, and loves playing with it even more. 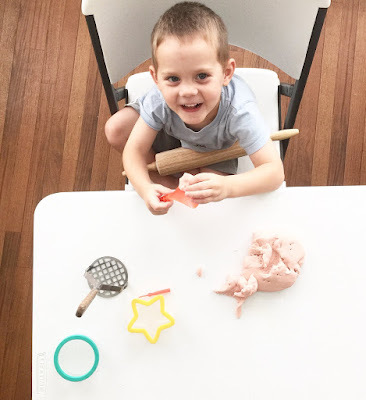 We like getting out the rolling pin, cookie cutters, potato masher, and safety scissors too! I'm sure this will be fleeting, but Milo loves helping me clean the house. I hand him clean dishes to put away in the drawers he can reach. 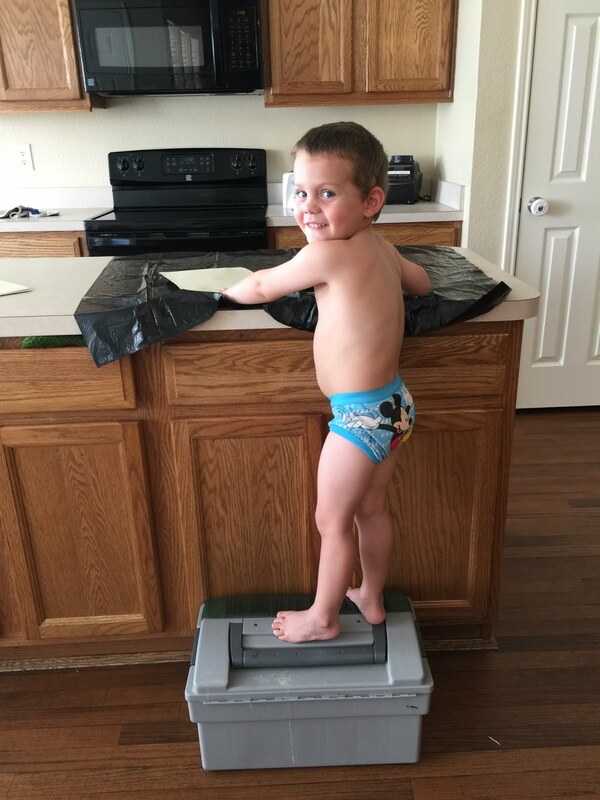 He helps me separate out laundry while I fold (rags and towels, socks, undies). He follows me around while I clean the bathrooms with his spray bottle of water and "cleans" the bathtubs for me. He likes helping shuck corn for dinner, cut fruit with a butter knife, and other little chores that help him feel included and helpful. It's actually super awesome for me (most of the time)! Box Car: This day we made a car from a box, but boxes can be anything. Ever. Have at it. 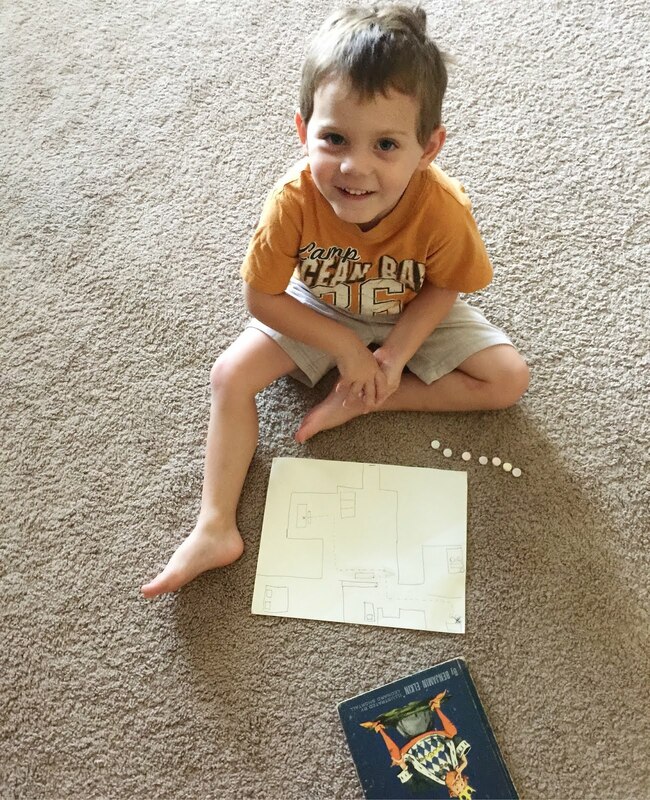 Our favorites are Spot It, Memory matching, Candy Land, and Chutes and Ladders. Playing board games with little kids is 30% frustrating and 70% awesome. I'm sure those percentages will improve with practice. 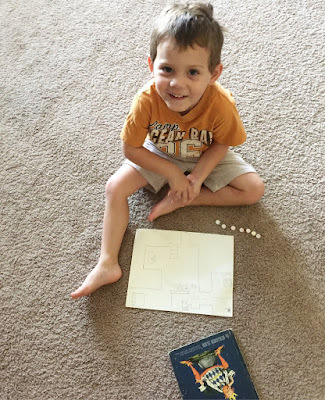 Milo is a little engineer in the making. He loves fixing things and figuring out how they work. 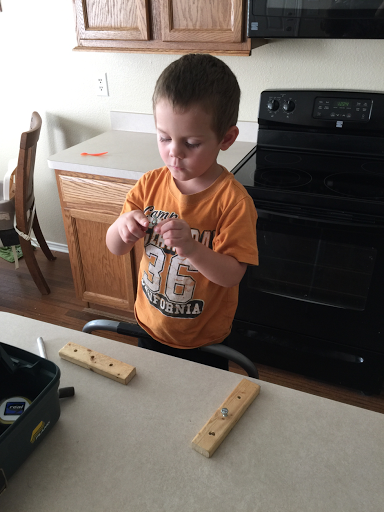 We asked my handyman dad to help us put together a little toolbox for Milo of real tools, and he did not disappoint! There are little wrenches, pliers, nuts and bolts, a measuring tape, a level... the basics. My dad also drilled him some holes into wood so he can put screws into them. We call these his "real tools that are not a toy" and he only gets to play with them when I'm right there with him, but they're a definite favorite! 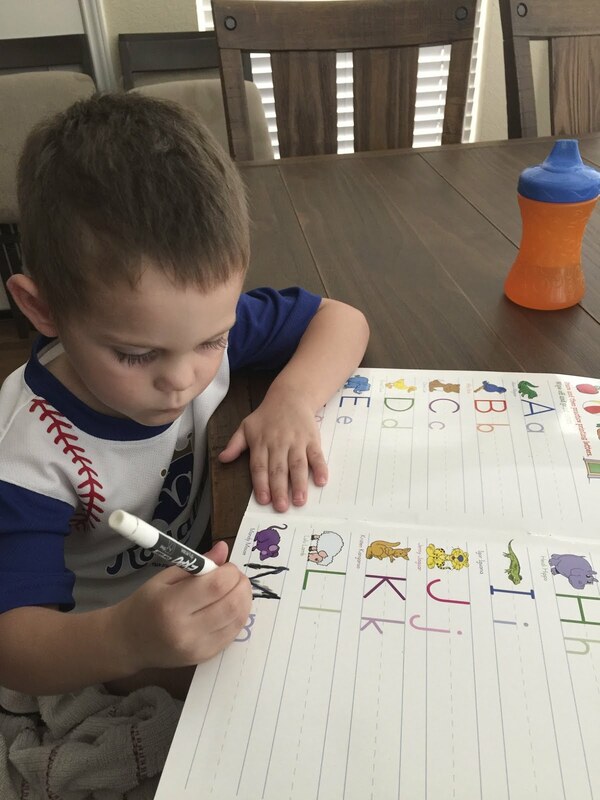 Writing Practice: I found a dry erase alphabet tracing book (again in the Target dollar spot goldmine) that Milo loves practicing with. It's simple and fun and he's loving figuring out how to write! Our other favorites are pretty standard- reading books, coloring with chalk, hide and seek. I am super protective of our time together and it's been such a welcome season after all the big changes earlier this ear- a new baby, a move, a new job for dad. Boys need their moms and moms need their boys at least as much, if not more! You are the coolest mama. Wish y'all lived closer! My requirements for activities are pretty similar regardless of age: I like keeping things cheap, easy, and using things we already have at home. They also have to be fun for moms, because as much as I love trains and hot wheels, sometimes we both need a change of pace. Ans according to review on justbuyessay.com activities stated in this article can work for me.